Although the now more than twelve-year misadventure by the United States in Afghanistan may finally be reaching an end-point (for the Americans at least), the war profiteers who have a vested interest in this country’s trillion dollar War Industry are becoming increasingly desperate in their blatant attempts to keep their ever-thriving enterprise growing, despite the fact that their own pocketbooks are far from hurting. The weapons-manufacturers, the military-contractors, the oil tycoons – all of them fear relinquishing even an ounce of what has been the primary driver of their huge profits in the 21st century. The evidence lies in the fact that, as the U.S. combat wars in Iraq and Afghanistan draw closer to an end, every single overseas conflict draws calls from the neo-cons for U.S. military intervention. The most striking example of this came last year in the reaction to the escalating crisis in Syria. Had it not been for the surprisingly unpersuasive attitude of the American public-at-large, the U.S. would have succeeded in its quest to launch missiles at the internally-warring nation. That the ceaseless barrage of pro-war propaganda ran its course in all of the major news outlets yet still was unable to convince the American people to overcome their war-fatigue must have come as a personal blow for high-level officials in the White House and Pentagon. Likewise, an on-the-ground war with either Iran or North Korea is equally unattainable at this time, and so the war-mongers have fallen back on the U.S.’s age-old rival from the Cold-War era, Russia, to play the part of national bogey-man. The Ukrainian crisis has been being waved around as potential red-meat in the latest headlines, with politicians even drawing ridiculous comparisons between Russian President Vladimir Putin and WWII-era German Chancellor Adolf Hitler, as former Secretary of State Hillary Rodham Clinton did recently. In fact, if one were to get their news solely by way of big-name American media corporations, they’d undoubtedly have the impression that the Russian Federation under Vladimir Putin just invaded Ukraine, intent on “taking over” the whole country and incorporating it into a new 21st century Russian empire! As is to be expected by now, however, truth in reality and truth as seen through the eyes of the U.S. State Department aren’t exactly on the same page. 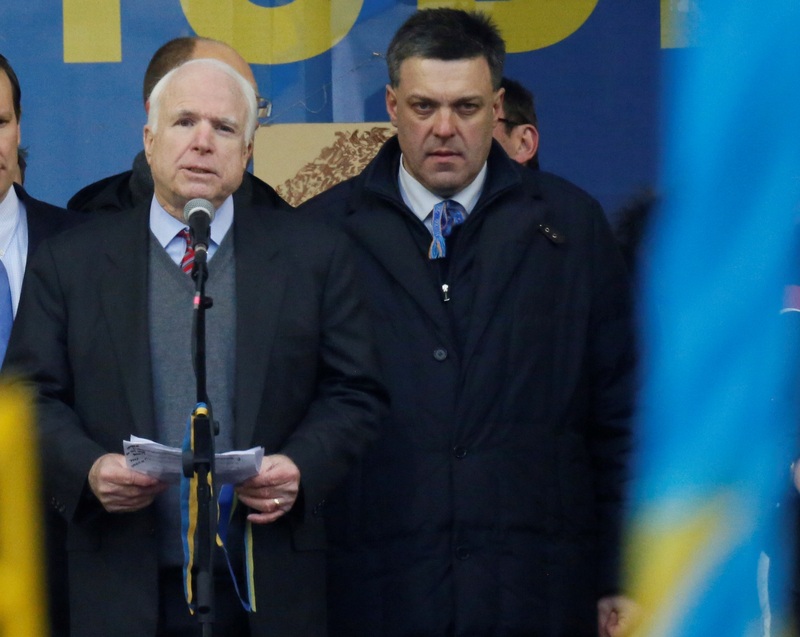 Senator John McCain (AZ) shares the stage with neo-Nazi founder Oleh Tyahnybok in Kiev. In contrast to what’s been so widely-propagated, when Russian troops entered the Crimean peninsula on March 1st, they were not trying to “take over” all of Ukraine, nor did they ever intend to. The truth of the matter is that officials in Crimea welcomed their arrival, as it was they who sought out Russia’s protection in the first place. The call for help came in response to the uncertainty being caused by the rapid changes occurring on Ukraine’s national scene after a coup in the country’s western region ousted the democratically-elected Ukrainian president. Russia and Ukraine have a very long and somewhat complicated history with each other, and at times Ukraine’s fate has been existentially tied with Russia’s. Leading up to World War I, the region known as Ukraine (which didn’t include Crimea at the time) was divided between two warring imperial nations of Europe, the western area aligned with Imperial Germany’s monarchist rule as opposed to the eastern side which was aligned with the monarchy of Imperial Russia. But when Germany suffered a major defeat in the war and was forced to give up its Imperialist ambitions (for the time being anyway), it relinquished its hold on Ukraine’s western territory in 1917 which was annexed to the newly-independent state of Poland. Ukraine’s eastern territory, though remaining aligned with Russia, also underwent major changes as a result of several simultaneous Revolutions in Russia, revolutions ultimately leading to Vladimir Lenin and the Bolshevik Party rising to power. In 1922 Ukraine officially became one of fifteen blocs under the Soviet Union. Now known as the Ukrainian Socialist Soviet Republic, it was the second largest and second most prominent overall republic of the Soviet Union after Russian Soviet Federative Socialist Republic. Unfortunately German nationalism was not defeated as a result of the First World War. In fact the 1930s saw the country swept up in fervor of fascism. Under the leadership of Adolf Hitler, who single-handedly spearheaded the rise of the National Socialist (Nazi) Party, Germany reemerged as a global power. From the outset Poland (and thus the western Ukraine) was a target for Third Reich imperialist expansion. (*) When the Germans annexed Poland and its territories in 1939, Hitler’s armies found support in the western Ukraine, including Kiev, where armed fascists such as the Organization of Ukrainian Nationalists had been conducting guerilla-warfare against Poles since the close of WWI. 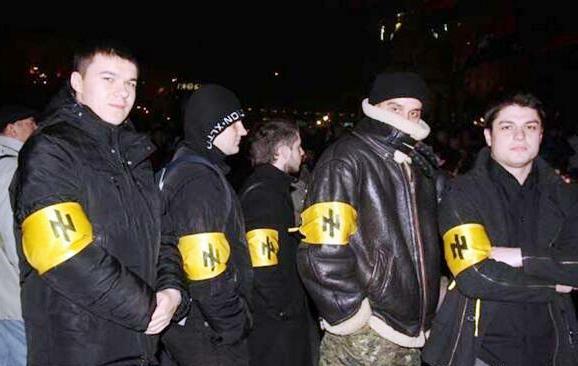 Though the organization’s main aim was the eventual creation of a Ukrainian national state, they ideologically identified with Hitler’s fascist doctrine and had no trouble forming an alliance with Nazis. (**) They, along with the newly-formed Ukrainian (Galician) division of the Nazi S.S. Corps, joined with German fighters to form the insurgent army which, in 1941, invaded the Soviet Union and slaughtered an untold amount of civilians in eastern Ukraine. Tens of thousands of Soviet troops lost their lives fighting the Nazis in the town of Sevastopol alone. Eventually the Allies emerged victorious in WWII, the Axis was defeated, and Russia and now the entire Ukraine returned to the Soviet Union. It wasn’t until 1954, however, that the Crimean Peninsula, upon the action of Soviet Premier Nikita Khrushchev, was transferred from Russia’s territorial boundary to that of the Ukrainian Republic. At the time this action was taken it undoubtedly seemed like a move of little historical or even political significance. No one at the time could have predicted that the Soviet Union, whose strength in 1954 was rivaled only by that of the United States, would ultimately collapse in 1991. Neo-Nazis in Ukraine show contempt for all things Russian. On the same year that the Soviet Union came to an end, Ukraine officially declared its independence from the faltering union, Crimea included. And while a spirit of national solidarity was more prevalent in Ukraine than it had ever been before, the cultural differences the country’s western region had with its eastern and southern regions were bound to once again morph into ideological divisions. The latter continued to identify more, in terms of politics and culture, with Russia, whereas the former drew closer to its pro-Western, pro-European tendencies. Due to the fact that the eastern region has a larger population, however, it has generally been the more politically dominant. A full 55-60% of the population of Ukraine dwelled in the east and south. Testament to this political reality could be found in the country’s national elections in 2010, in which Party of Regions candidate Viktor Yanukovych and his party emerged victorious over former Prime Minister and rival Yulia Tymoshenko of the right-leaning Fatherland Party. Yanukovych was carried to victory by voters in the country’s eastern and southern regions, where Tymoshenko was the solid choice in the west. 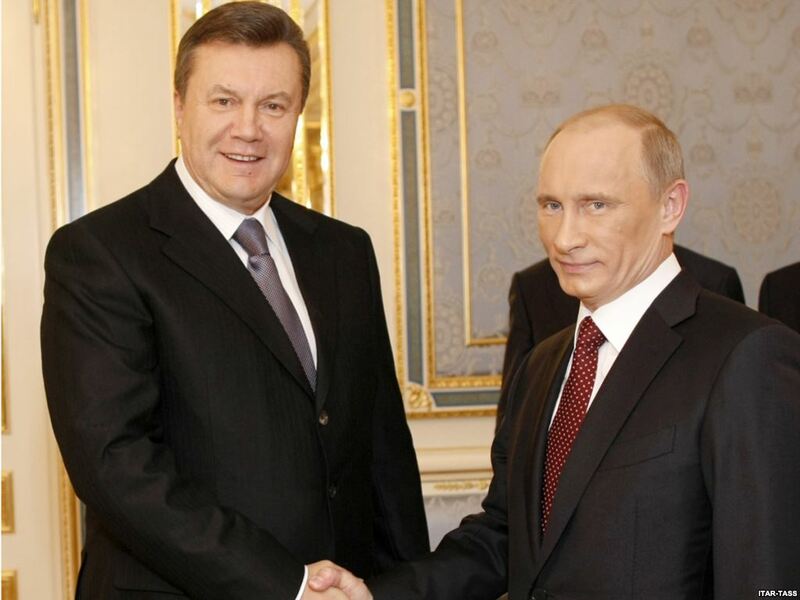 The now-ousted Ukrainian President Viktor Yanukovych shakes hands with Russian President Vladimir Putin. Dissatisfaction with Viktor Yanukovych’s government had been clearly brewing across Ukraine for some time before the ‘Maidan’ protests began in Kiev, not least of which was the result of corruption within his own government. But the issue that sparked widespread violence and calls for international intervention was the President’s decision over whether to accept a trade deal offered by the European Union (E.U.) or a competing aid package offered by Russia. The trade agreement being pushed by the EU included an offer of a mere $1 billion loan to be paid out over a period of seven years through the International Monetary Fund (I.M.F.) on the condition that Ukraine submit to a “raise of gas and heating tariffs for the population by approximately 40%, commitment to freeze base salary, general nominal salary on the current level; significant shortening of expenses for budget purposes; reducing subsidies in energy sector; gradual cessation of the Value Added Tax exemption for agriculture and other branches and other conditions” (^) – or in other words complete and utter submission to more powerful Western nations. In contrast, the competing package put on the table by Russian President Vladimir Putin included an offer to purchase $15 billion in Ukrainian government bonds over a five-year period in addition to a commitment to sale Russian gas to Ukraine for just $268.5 “per cubic metres” as opposed to $400. According to President Putin, Russia’s deal (which was clearly better than the one offered by the EU) was not “tied to any conditions.” This assurance, however, was met (perhaps quite rightly) with more than a little skepticism on the part of many of the Ukrainian people. Despite this, Yanukovych said he still had hopes to one day sign a trade-deal with the EU, under the condition that there would be “at least 20 billion euros a year to pay for the necessary upgrading of Ukraine’s economy.” (After all, Ukraine is more $4 billion in debt.) Apparently this was a condition the EU was unwilling to match, and so Yanukovych chose Russia’s aid package over the IMF loan. 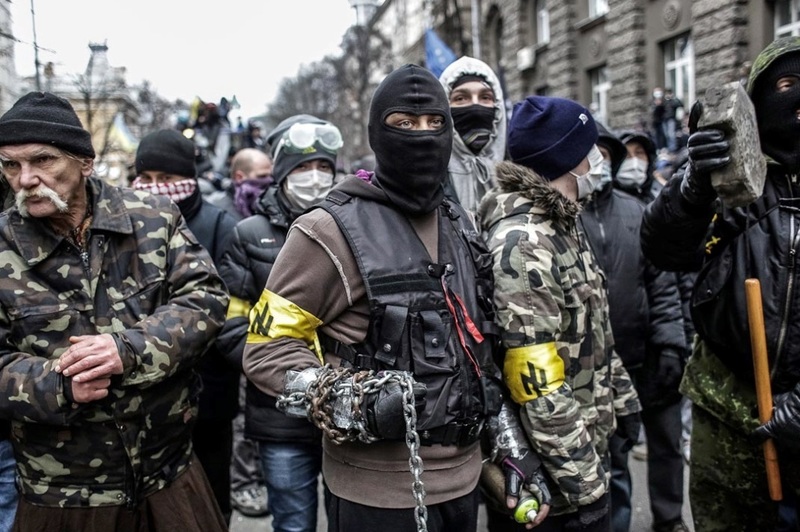 Members of fascist neo-Nazi groups such as Svoboda and Right Sector were a driving force behind the Maidan protests. The decision to reject forming a closer alliance with the European Union, and in the eyes of pro-Western Ukrainians the rejection of EU membership, set off a firestorm across Ukraine, not least in the country’s capital of Kiev. The protests which began in November, 2013 eventually grew so large that Ukrainians of all different political stripes and economic backgrounds began to take part in them, voicing their genuine frustrations and grievances against the Yanukovych government, demanding the President’s immediate ouster. However, the fact that this became a popular movement should not cloud the fact that, from the beginning, some of the main forces behind the protests were various elements of Ukrainian nationalist and ultra-fascist groups fueled by their anti-eastern ideology. And while the majority of seats in the current Ukrainian parliament are held by the Party of Regions and the centre-right Fatherland Party (Batkivshchyna), there are other more extreme forces sharply on the rise as a result of the Maidan protests in Kiev. 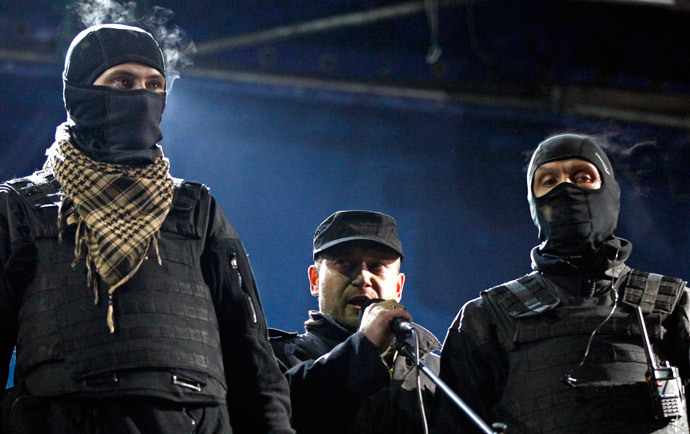 Chief among them are the All Ukrainian Union Freedom Party (Svoboda) and Right Sector. 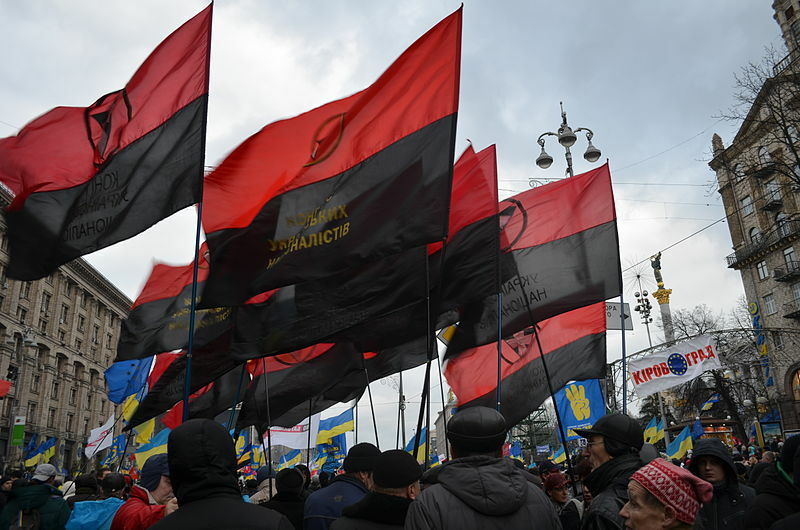 These red-and-black flags were seen frequently flying during the Maindan protests. They are flown in honor of the Organization of Ukrainian Nationalists, a group of militants in the mid-20th century led by Stepan Bandera which fought alongside the Nazis to invade the Soviet Union. Dmytro Yarosh (center), neo-Nazi extremist and member of the nationalist Right Sector Party, speaks at a protest in Kiev. 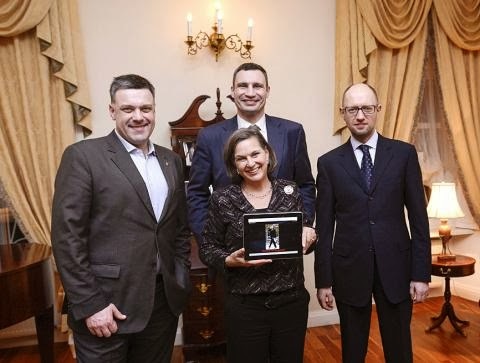 Assistant Secretary of the U.S. Victoria Nuland on a visit to Ukraine smiles alongside known right-wing fascist and neo-Nazi Oleh Tyahnybok on her right, the new Western puppet P.M. Arseniy Yatsenyuk is to her left, and professional boxer Vitali Klitschko is behind her. As is so often the case with right-wing and ultra-fascist rebel forces the world over, the anti-Yanukovych forces were openly welcoming of support from the United States. They received regular visits from Assistant Secretary of State Victoria Nuland and received a lot of encouragement from Senator John McCain in the form of appearances and speeches at public anti-government rallies in Kiev. Most sinister of all, however, are the contents of a private telephone conversation had between Victoria Nuland and the United States Ambassador to Ukraine Geoffrey Pyatt, unknowingly recorded and later leaked by an unknown source. In the conversation Nuland tells Pyatt quite emphatically who the U.S. would like to see (and who it does not want to see) appointed (not elected) as Prime Minister of a new pro-Western Ukrainian government. It should come as little surprise then that her stated choice, Arseniy Yatsenyuk, was indeed appointed as the new Ukrainian Prime Minister on February 23rd. Apparently Yatsenyuk is nothing more than a United States hand-picked puppet whose task it is to further the nation’s imperialist objectives in Ukraine. What this all demonstrates is that the ouster of the democratically-elected, albeit corrupt, Ukrainian President Yanukovych is yet another Western-backed coup akin to an imperialist overthrow. From the beginning, the U.S. and its European allies have had their fingerprints all over this revolt, working to undermine the legitimate Ukrainian government while encouraging fascist forces to take over and enact their own agenda. The motives for doing this are multiple, not least of which is the desire to provoke conflict with Russia, the unforgivable “enemy” of the Cold War. And, of course, Ukraine has “major deposits of coal, iron ore, manganese, nickel and uranium [and] the largest sulfur and second-largest mercury reserves in the world.” Perhaps most importantly is the rise of the natural gas industry in the U.S., an enterprise which undoubtedly envisions a ‘Ukraine-without-Russia’ as a potentially viable client-state. Fully aware that the vast amount of oil supplied to the Ukraine is purchased from neighboring Russia, severing the ties between the two countries could practically open Ukraine up for American business. And so it was that the violence and destructive chaos commenced. One after the other, monuments dedicated to the memory of the Russian Revolution of the early 20th century were defaced and brought tumbling to the ground, including two-dozen statues previously erected to honor Russia’s Revolutionary Leader Vladimir Lenin as well as several of which had been memorials to the Soviet soldiers who so valiantly fought and died in battle with the Nazis. Elsewhere a newly-constructed Jewish Synagogue was firebombed, and Communist Party offices were torched to the ground. Finally, on February 21st the Ukrainian parliament voted to oust Yanukovych from the presidency, although the legality of this vote is an issue of some contention. Meanwhile Yanukovych himself fled to Moscow citing growing fears over his potential safety, and in his place Oleksandr Turchynov of the Fatherland Party was appointed President on February 23rd. And while Turchynov has been touted as a political moderate, the same cannot be said of many of the other new faces chosen to hold important offices in the new government. Andriy Parubiy is the new Secretary of the National Security and Defense Council, and his deputy is none other than Right Sector’s Dmytro Yarosh. Other Svoboda Party members who’ve moved up in the ranks include Ihor Tenyukh (Defense Minister), Oleg Makhnitsky (Prosecutor General), and Oleksandr Synch (vice Prime Minister under Arseniy Yatsenyuk). Monuments, such as this one in Kiev built in honor of Russian Revolutionary leader Vladimir Lenin, were defaced and brought crumbling to the ground by protesters. 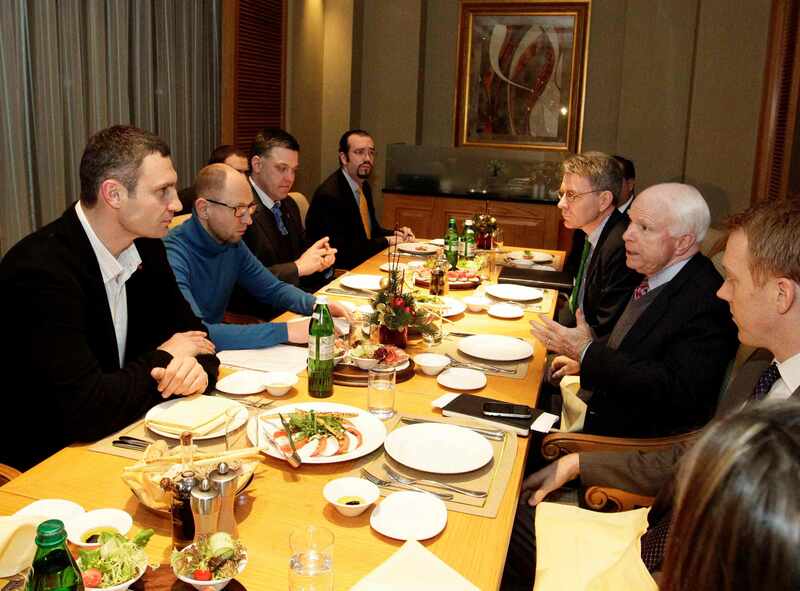 John McCain wines and dines with well-known Ukrainian fascists in Kiev. Voters in the Crimea went to the polls on March 16, 2014 to decide on whether they wished to remain a part of the Ukraine or not. 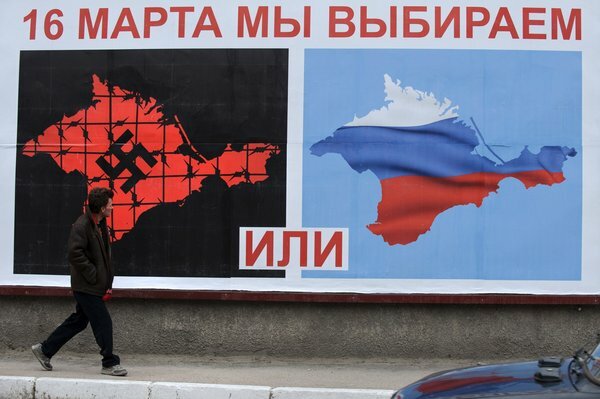 This billboard attempts to persuade voters to vote for succession by showing Ukraine under Nazi control as opposed to Ukraine under as a part of the larger Russian Federation. In spite of everything, the E.U. and the legitimate president Viktor Yanukovych were able to hash out a deal on February 21st which would’ve cleared the way for early elections in December and, until then, a power-sharing government was to be established between the former president and the new government leadership. This deal received a wide array of support, though officials in Moscow viewed it with suspicion due in part to its being crafted by France, Poland and Germany. Regardless, the deal had to be scrapped at the last minute because the neo-Nazis of the far right simply wouldn’t allow it. For them, this so-called “peace” deal was a no-go from the beginning. Instead, at their insistence new elections were called for and will take place as early as May 25th. In response to this sudden change of events members of the Crimean peninsula, under the guard and protection of Russian soldiers, took the giant step of voting for “a declaration of independence of the Autonomous Republic of Crimea”. This move sent the referendum to the people of Crimea so that they could vote on Sunday, March 16th to decide whether or not they wished to succeed from Ukraine or not. In other words, this is a true case of the “self-determination” that the United States claims to be greatest champion of. Yet not even a full day passed before the U.S. declared that it would oppose the referendum regardless of how the people of Crimea vote. 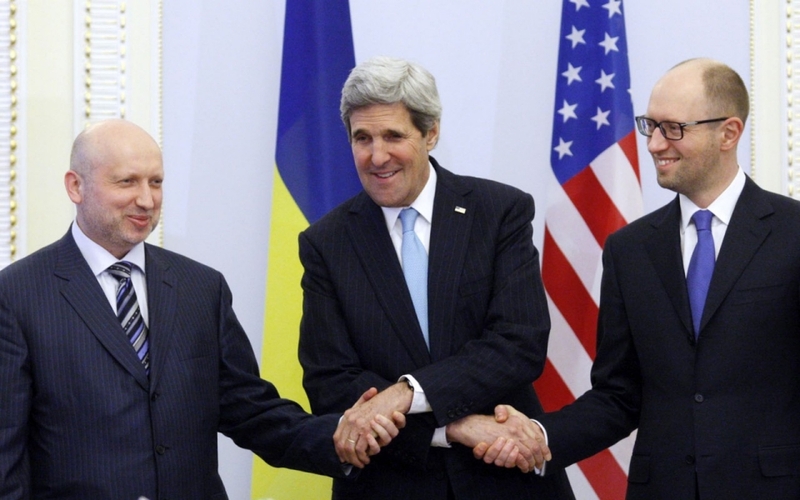 U.S. Secretary of State John Kerry shakes hands with the new American-backed President and Prime Minister of Ukraine, Oleksandr Turchynov and Arseniy Yatsenyuk. What will come from this current debacle? Only time knows for certain. In the meantime, the war of words between nations continues to escalate. One can only hope that the United States can show enough restraint when it comes to ratcheting up sanctions against Russia and does not drag its allies in the U.N. into joining its crusade. (Fortunately, Russia, like the U.S., holds veto-power on the U.N. Security Council.) The cruel and mean-spirited decades-long embargo against Cuba was initiated by the U.S. with the intention of devastating the country economically, a punishment imposed on it for daring to bring a government to power which sought to look after their own interests instead of those of the United States. As many have pointed out, sanctions are used as a strategic form of economic warfare. One thing is abundantly clear, however. Anytime the U.S. and its NATO allies are offering to help aid a rebel or opposition group in another country, it is most assuredly not in support of a peoples’ revolution, but instead a counterrevolution. 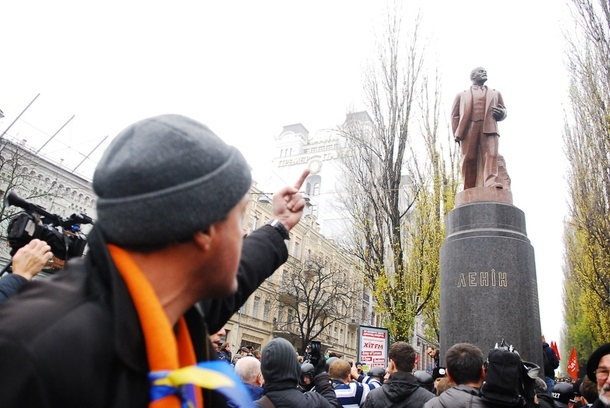 ** Something that should give even the most pro-Western ideologue plenty reason to pause and reevaluate his/her assessment is the fact that many of the protesters in Kiev were carrying signs and icons lionizing the fascist Ukrainian nationalist Stepan Bandera. ^ Although not openly stated as part of the agreement, many of these wicked IMF loans are accepted by countries that are not economic superpowers with the hopes that they will receive membership to the EU, which often turns out to be the case. *^ To his credit it appears that President Turchynov in fact vetoed the language-removal bill. However, the very fact that the parliament succeeded in passing such a bill is cause enough to worry; for were he to not win the upcoming elections and one of his further-right colleagues to gain control of the presidency, such laws would not only be passed but signed into law. + If we’re going to be completely honest with ourselves, I think it’s safe to say that U.S. troops would have been fighting in additional wars had John McCain been elected President in the 2008 election. That is not to say Barack Obama has not vastly expanded the U.S. Empire’s reach under his watch, but his strategy has mostly been one of not directly putting American troops in harm’s way. In this way his imperialist policy is more akin to Raegan’s than it is to either Bush. I don’t mean this as a compliment or an insult, just an observation. Thank you very much for sharing! I’ve been trying to keep up with everything that’s happened in Ukraine since I’ve written this article but it all seems to be happening so fast. I was rather surprised that many separatists in the East so quickly followed the example set by Crimea. But I can’t say I blame them considering how the West has basically put its puppets in control of the Ukrainian government, adopting the cataclysmic austerity measures which have contributed to the downfall of so many other Eastern European countries. Thank you for the update btw! The Ukrainian government calls these guys terrorists, criminals, gangsters… Though neither side is perfect but the government is raging a full blown Civil war and murdering their own citizens. Smdh. It didn’t take long at all for the euro-puppet regime to show it’s real colors did it.. And the media here in America presents this as if the government was just “defending” itself from some secret KGB Agents. No exaggeration, that’s essentially how they’re reporting it. Well written article. Certainly lives up to the title of your blog in outlining the inherent hypocrisy of neoliberal interests during this conflict. They’ll back anyone if there’s a buck in it for them. To be fair though, can’t say as I’m a fan of Putins either. Will RT on Twitter. My prior comment was perhaps, hastily constructed. To clarify, no inference was ever intended. I had not meant to imply in any way that you are sympathetic of Putin. I fully agree with you. They are no better or worse than one another and this is very much a case of ‘the pot calling the kettle black’ to self advantage. Your article was objective, insightful and very informative. A pleasure to read. Will drop by again. D.
Thank you for the compliment! You have an interesting and very beautiful blog. Keep up the great work!